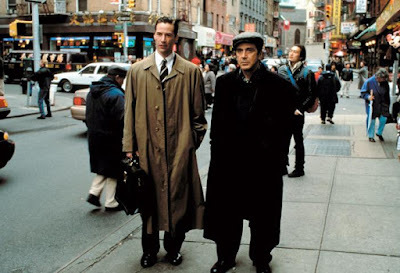 The Devil’s Advocate is an interesting film. In many ways, it is deeply flawed to the point of driving me nuts. But it has something that always draws me back in. What is that? 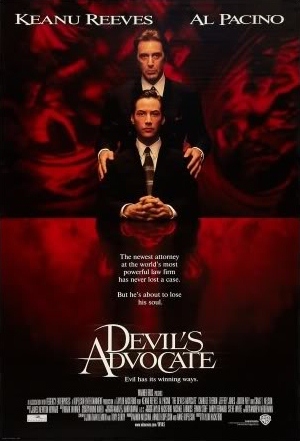 At its core, The Devil’s Advocate is a fascinatingly subtle film centered around a philosophical debate surrounding the morality of the idea of devil’s advocacy itself. What am I talking about? Read on. The story begins with Gainesville, Florida attorney Kevin Lomax (Keanu Reeves) defending a school teacher accused of child molestation. Lomax has an “unbeaten” streak in trials, but this case is hopeless. Lomax, however, refuses to lose. He gathers his resolve and tears the young girl apart on the stand and gets his client acquitted. Of course, the client is guilty and Lomax’s victory will result in tragedy. After the trial, a representative of a New York City law firm offers Lomax a lot of money to help pick a jury for a trial in New York City. Lomax agrees and the jury brings back a not guilty verdict. 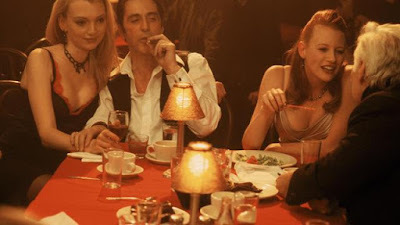 After this, John Milton (Al Pacino), the head of the firm, offers Lomax a job with the firm. Lomax accepts and moves his young wife Mary Ann (Charlize Theron) to New York City with him. They immediately find themselves hobnobbing with the rich and famous. 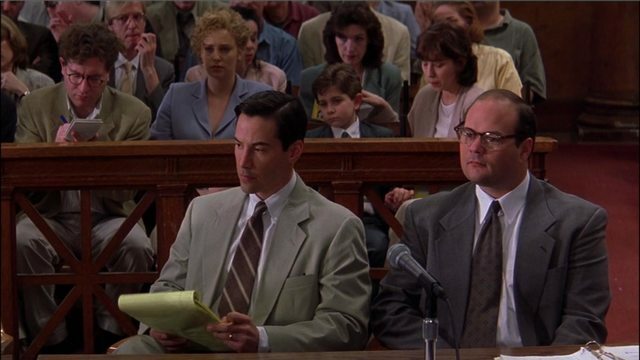 Lomax is then tasked to defend a billionaire, Alex Cullen (Craig T. Nelson), who is accused of murdering his wife. Lomax’s life soon begins to unravel. 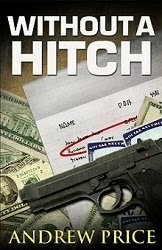 His wife becomes paranoia and worries that he’s having an affair. She is told that she is infertile and she tries to kill herself at a critical time for Lomax after Milton rapes her in a dream; Lomax doesn’t believe her. At the same time, Lomax discovers that the firm is engaged in shady practices. The Justice Department is after the firm. 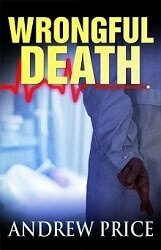 People die around the firm. He fights with the firm’s managing partner Eddie Barzoon. Lomax’s mother tells him that Milton is the Devil and that he also happens to be Lomax’s father. And he realizes that his clients are lying and are forcing him into unethical positions. As everything climaxes for Lomax, Milton tells Lomax that he is really the Devil and that Lomax is actually his son. He wants Lomax to join him and together they will use the law to destroy the world. There are many things that drive me nuts with The Devil’s Advocate. The legal aspects of the film are utterly fake. Basically, anything you see in a courtroom is not how it really happens. I don’t understand why Satan would hire an Eddie Barzoon. Surely, he can find someone a good deal sharper and more reliable amongst his minions. Milton talks about using the law to destroy the system, but the trials in which they engage seem rather minor for the purpose. Milton’s big speech revealing his plan is utter nonsense, as is his verbal attack on Barzoon as Barzoon is hunted down and killed by Milton’s agents. Examine the sentences of either speech without Al Pacino overacting in your face and you’ll see that they make no sense at all. In a normal movie, this would be enough to turn me off. But The Devil’s Advocate isn’t a normal movie. As I said above, The Devil’s Advocate is a fascinatingly subtle film. It takes on the question of whether or not we have pushed the idea of devil’s advocacy too far to the point of justifying immorality. What’s more, it suggests that we have blinded ourselves to this fact. To understand this, let me first explain what a devil’s advocate is because this is important. A devil’s advocate is someone who adopts a position they believe to be wrong, immoral or false merely for the sake of argument for the purpose of forcing another to defend against or explain away that position. The key here is that they adopt that position only for the sake of argument... they don’t actually support the position or act in accordance with it. Unfortunately, too many people seem to have lost this critical aspect of devil’s advocacy. Instead, they have morphed the idea into a justification for letting them act in immoral ways. For example, advertisers might push a product with claims they know are not true on the basis that their jobs is to advertise, not be regulators of truth. Cops and prosecutors enforce laws they see as immoral on the basis that their job is to enforce the law, not make it. And lawyers... well, lawyers are the worst. Attorney are often charged with representing people they consider repugnant or guilty or with whom they don’t agree, and the rules of ethics excuse this behavior. Basically, the rules by which attorneys operate let them separate themselves from their clients to such a degree that many attorneys can happily go all out to represent monsters without ever feeling responsible for the consequences of these people being set free to continue their horrors. What The Devil’s Advocate does is ask if we are able to see this problem. Indeed, the entire film is centered around this. Lomax begins the story by representing a man he knows to be guilty. And rather than letting the man be punished, he destroys a little girl to save his client. Each of the clients he represents at Milton’s firm present similar dilemmas for him. Likewise, he sees that his wife is falling apart and needs his help, but again, he tells himself that he can act in contradiction to his beliefs and principles long enough to achieve his purposes and then he will take care of her. Barzoon and the Justice Department both warn Lomax that Milton’s firm is evil, but Lomax again hides behind a devil’s advocate argument that lets him ignore the misdeeds he sees on the basis that he’s not responsible for them personally. At each step in the story, when people try to warn him that he is acting morally incorrect, he dismisses their concerns on the basis of some need to play devil’s advocate, but he goes beyond that in each instance and he acts immorally rather than merely adopting an immoral position solely for the sake of argument. This is really clever. It’s also really refreshing. Whereas Hollywood typically makes characters into cardboard because anyone can understand cardboard, Lomax’s behaviors are anything but cardboard. He is the embodiment of an excuse that allows you to defend an intolerable evil... which is exactly what a devil’s advocate does, and then he becomes the evil himself. So what about the ending? It is interesting to me that the final scenes between Milton and Lomax are such cartoonish gibberish because everything up to that moment was subtle and powerful. But perhaps that is the point the screenwriter was making? Perhaps, the ultimate point is that it took this level of bombastic idiotic over-the-top cartoon evil before Lomax, an otherwise very intelligent man, awoke to what he was doing: you turned a blind eye when you represented a child molester... you turned a blind eye when your wife fell apart... you turned a blind eye when your company engaged in criminal activities... when you cheated in court... when you helped a murder... and you only finally opened your eyes when Satan himself was acting like a cartoon villain in your face! Perhaps that is the point, that we should examine how often in our own lives we excuse the consequences of our actions as not being our responsibility. Or maybe it was just poor writing. I liked this film, it caused me to reflect on my own life choices and the consequences of those choices that I have excused. 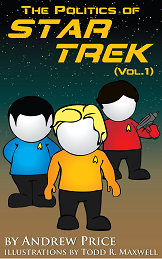 The unrealistic court scenes and the cartoony villainy stuff at the end was irksome however. And it sort of seemed to me like the movie just unravelled by the end, and could have been a great film had the writing remained consistently good. I wanted to like this movie, and have seen it several times, but I too, could not get past the ridiculous courtroom scenes, but due to your analysis, I see it in a different light. I haven't seen the film, but your description of it makes me think the Devil's plan is maybe being worked across multiple lawyers and law firms, and the film is just focused on the one. The way you related the bleeding of Devil's advocacy into actual immoral acts in the real world makes the idea seem sensible. Thanks Allena! This movie has driven me nuts for years. On the one hand, so much of it is so so good and so well done. But then you have these moments that just kill me. The trial stuff drives me nuts as a lawyer, but what really bothered me were the two speeches by Pacino. They sound great if your brain is off but if you think about the words he's saying, it's all nonsense. That always bothered me. I think though, that this makes sense in the context of that I have explained in the review. It still bothers me and I would have gone very differently with how Satan presents himself, but it makes sense to me if the screenwriter really is intentionally making him more cartoony at that point. You're welcome, Pope! Like you, this one drives me nuts. It's so good in so many ways and then it has these flaws that just bug me. I think it makes sense, as I've explained it (and the court stuff is typical Hollywood), but it still does bother me. The thing is, I see such potential to make an amazing film out of this -- to hit a true home run of a movie -- but those flaws drag it back to the realm of a good, but frustratingly flawed film. tryanmax, I think ultimately that is the Devil's plan here. He wants to use the legal system and this idea of "it's just my job" to divorce right and wrong/morality from law (and likely other professions as well). The result would be that society become truly immoral because morality would be removed from societal decisions. Then it's a short hop to individuals becoming personally immoral as they get their cues on how to act from society. And I think his point is that all these people who think that you can act immorally so long as you excuse it by claiming it's just part of your job and doesn't mean anything personally, are becoming his agents, whether they know it or not. That's actually a fairly conservative criticism of the law and modern society, that we are removing right and wrong and replacing it with procedure. In any event, I recommend seeing this one, but I think you will find those two speeches by Pacino to be silly, nonsensical and vastly overacted. I'll check if it's in Netflix or Prime. Ill say this about Pacino: he can do subtle very well, so I assume in advance the overacting was a directorial decision. Thanks for the review. I liked the film. I always took it as more of a Faustian bargain. Once you make the deal and lose your soul you lose everything. Maybe we are seeing the same principle slightly differently.